We are grateful that we were invited by Farmhopping and we would like to thank them for the perfect arrangement and for all they do to make the connection between the farmers and their customers easy and fast. We thank all colleagues for making the bazaar colorful, tasty and unforgettable! 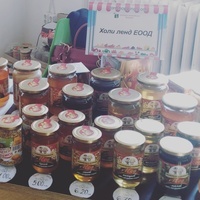 We thank all visitors at the Christmas bazaar for their smiles, for their interest in all farmers' products, especially in our bees and the way we process the honey. We thank them for picking up Christmas recipes and for choosing a healthy life and for trusting the fresh, pure food that comes directly from those who grow it. We thank everyone for the lovely Christmas mood! Happy holidays! See you soon!